The Last Exorcism is a bit of an advancement in the evolution of two sub-genres; one, the documentary-style, yet still very much fiction, horror film we’ve now seen with The Last Broadcast, The Blair Witch Project, Quarantine, Cloverfield, The Fourth Kind, and most recently, Paranormal Activity, and two, the exorcism horror genre that includes the granddaddy, The Exorcist, and the recent mid-level hit The Exorcism of Emily Rose. We don’t see many exorcism films, I’m certain, because The Exorcist pretty much set the standard and its impossible to make one without looking exactly like it. The subject of exorcism is so specific, it’s hard to look distinguished. And, stripped down, The Last Exorcism is very much like The Exorcist: a young girl possessed by a demon, resides in an upstairs bedroom, and a religious figure is trying to cast the Hell-spawn out. The difference is the documentation (it’s real! ), the motives of the religious figure, the method of the scares, and the reasons for the possession in the first place. Cotton Marcus (Patrick Fabian) is a southern preacher from Baton Rouge who wants to disprove the idea of exorcism, in the hopes that they are never performed again. This is spurred on by the death of a child who suffocated during one. Cotton gets a letter from Louis Sweetzer (Louis Hertham) claiming that his daughter Nell (Ashley Bell) is possessed, that animals around the farm have been brutally killed, and that she needs some exorcism but good. Cotton sees this as his opportunity, and has a bag of dirty tricks to make the exorcism look real, all the while documented to show how fake it is, and how the “possessed” end up taking the fake exorcism like a placebo, believing they are cured. It’s not easy, though. Louis’ son Caleb (Caleb Landry Jones) gives them a rude welcome, and seems to be on the verge of causing Cotton and his documentary crew physical harm at a moment’s notice. Nell does seem to have some sort of sickness, but Louis doesn’t like doctors after his wife died of cancer, and his former church doesn’t seem to think they can help persuade Louis to do the right thing, either. 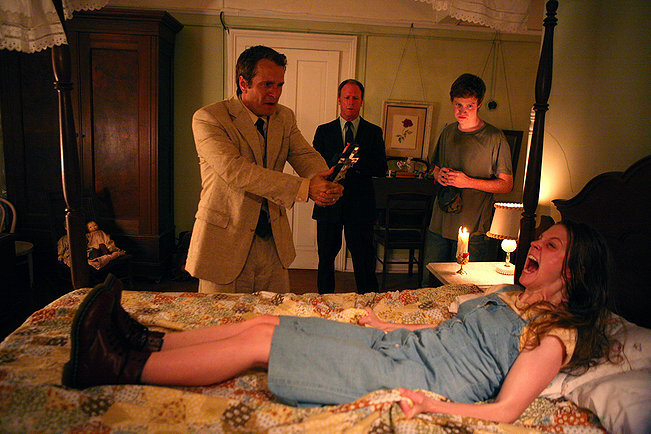 It does become clear, later, that Nell really is possessed, putting Cotton in a tough spot considering he doesn’t really know how to perform a real exorcism. I honestly didn’t have this one on my radar, and was dead-set against it ever being good. Eli Roth (Hostel) is a producer on this one, and it’s good to see him behind a flick that isn’t really gory and is mostly about mood and scares. Definitely a surprise.